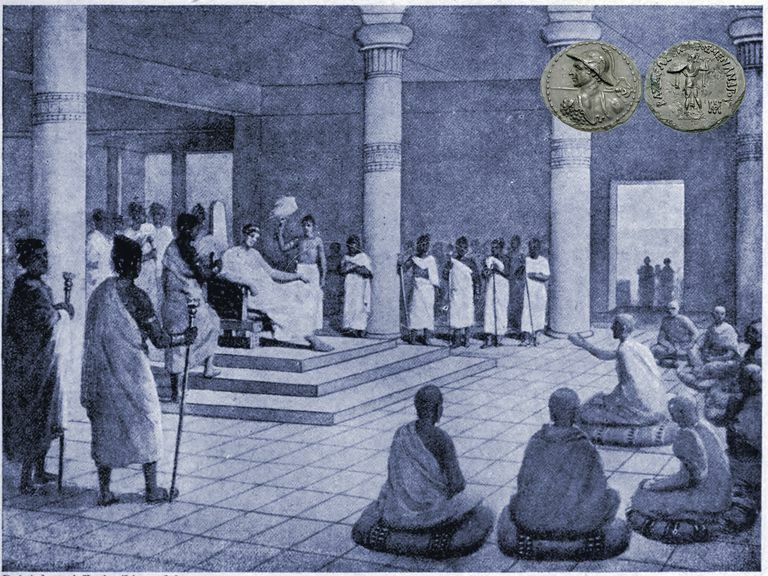 King Menander questions Nagasena, from a 19th century illustration. Coins with the likeness of Menander are in the upper right corner. The Milindapanha, or "Milinda's Questions," is an important early Buddhist text that usually is not included in the Pali Canon. Even so, the Milindapanha is cherished because it addresses many of Buddhism's most difficult doctrines with wit and clarity. The simile of a chariot used to explain the doctrine of anatta, or no-self, is the most famous part of the text. This simile is described below. The Milindapanha presents a dialogue between King Menander I (Milinda in Pali) and an enlightened Buddhist monk named Nagasena. Menander I was an Indo-Greek king thought to have ruled from about 160 to 130 BCE. He was a king of Bactria, an ancient kingdom that took in what is now Turkmenistan, Afghanistan, Uzbekistan, and Tajikistan, plus a small part of Pakistan. This is partly the same area that came to be the Buddhist kingdom of Gandhara. Menander was said to have been a devout Buddhist, and it is possible the Milindapanha was inspired by a real conversation between the king an enlightened teacher. The author of the text is unknown, however, and scholars say only a portion of the text may be as old as the 1st century BCE. The rest was written in Sri Lanka some time later. The Milindapanha is called a para-canonical text because it was not included in the Tipitika (of which the Pali Canon is the Pali version; see also the Chinese Canon). The Tipitika is said to have been finalized in the 3rd century BCE, before King Menander's day. However, in the Burmese version of the Pali Canon the Milindapanha is the 18th text in the Khuddaka Nikaya. Among the King's many questions to Nagasena are what is the doctrine of no-self, and how can rebirth happen without a soul? How is a not-self morally responsible for anything? What is the distinguishing characteristic of wisdom? What are the distinguishing characteristics of each of the Five Skandhas? Why do Buddhist scriptures seem to contradict each other? Nagasena answers each question with metaphors, analogies and similes. For example, Nagasena explained the importance of meditation by comparing meditation to the roof of a house. “As the rafters of a house connect up to the ridge-pole, and and the ridge-pole is the highest point of the roof, so do good qualities lead up to concentration," Nagasena said. One of the King's first questions is on the nature of the self and personal identity. Nagasena greeted the King by acknowledging that Nagasena was his name, but that "Nagasena" was only a designation; no permanent individual "Nagasena" could be found. This amused the King. Who is it that wears robes and takes food? he asked. If there is no Nagasena, who earns merit or demerit? Who causes karma? If what you say is true, a man could kill you and there would be no murder. "Nagasena" would be nothing but a sound. Nagasena asked the King how he had come to his hermitage, on foot or by horseback? I came in a chariot, the King said. But what is a chariot? Nagasena asked. Is it the wheels, or the axles, or the reigns, or the frame, or the seat, or the draught pole? Is it a combination of those elements? Or is it found outside those elements? The King answered no to each question. Then there is no chariot! Nagasena said. Now the King acknowledged the designation "chariot" depended on these constituent parts, but that "chariot" itself is a concept, or a mere name. Just so, Nagasena said, "Nagasena" is a designation for something conceptual. It is a mere name. When the constituent parts are present we call it a chariot; When the Five Skandhas are present, we call it a being. Nagasena added, " This was said by our sister Vajira when she was face to face with the Lord Buddha." Vajira was a nun and a disciple of the historical Buddha. She used the same chariot simile in an earlier text, the Vajira Sutta (Pali Sutta-pitaka, Samyutta Nikaya 5:10). However, in the Vajira Sutta the nun was speaking to the demon, Mara. Another way to understand the chariot simile is to imagine the chariot being taken apart. At what point in the dis-assembly does the chariot cease to be a chariot? We can update the simile to make it an automobile. As we disassemble the car, at what point is it not a car? When we take off the wheels? When we remove the seats? When we pry off the cylinder head? Any judgment we make is subjective. Perhaps you may argue that a pile of car parts is still a car, just not an assembled one. The point is, though, that "car" and "chariot" are concepts we project onto the constituent parts. But there is no "car" or "chariot" essence that somehow dwells within the parts.